In the past, Aviation flight following and tracking in Africa relied on VHF and HF radio. These systems were inefficient and often unavailable due to a lack of infrastructure in remote parts of the continent. Everett Aviation's commitment to Safety is paramount in all operations. Installing SkyTrac’s satellite based flight following hardware in each of their helicopters helped achieve this goal. The operations and dispatch department is responsible for providing flight following at all times when an Everett Aviation helicopter is in the air. All helicopter resources are displayed and viewed on an extra large screen in the office, which allows multiple flight tracking tasks to be accomplished efficiently. 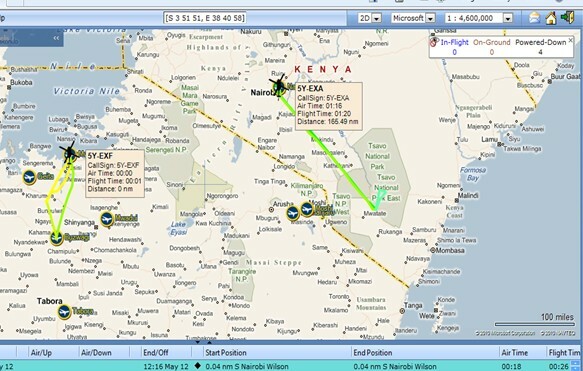 SkyTrac also provides SkyWeb which gives us the ability to allow client access to real time flight following and operational reports via any computer with an internet connection worldwide. Everett Aviation is the only SkyTrac dealer in Africa providing hardware installation, service, end user training and support.